The amazing thing is that unless it actually breaks the record it will be seen by those who regard themselves as “skeptics” as being unremarkable. Actually, even if it does break the record, it will probably still be seen as some kind of natural variation. They’re categorically insane. How many extreme events have to occur before they get it? I’m thinking the number is infinite and the best thing to do is somehow render these arguments moot. A rapid response to climate change is now required. Anyone pushing against that is essentially pumping water into an already sinking ship. Just yesterday, Steve Goddard posted fallacious pictures of Barrow in an attempt to claim it was still surrounded by snow. My words for him are: idiot, fool, ignoramus, and wanton shill for misinformation. I have a few more choice words, but I won’t utter them here. There is harm on his head, though. A growing harm that will weigh him down moreso than any chain on the fictional Jacob Marley. I didn’t see the Steve Goddard post. I shall have to have a look. My forgiving self thinks that maybe some people just don’t understand the concept of a distribution function and that as you add energy you make extreme events more likely. My less forgiving self feels that these people are either deluded or are knowingly misinforming for reasons as yet to be determined. Knowingly misinforming = Steve Goddard and Anthony Watts. Deluded = the poor fools who listen to and believe them. You have posted about heatwaves in Alaska too. 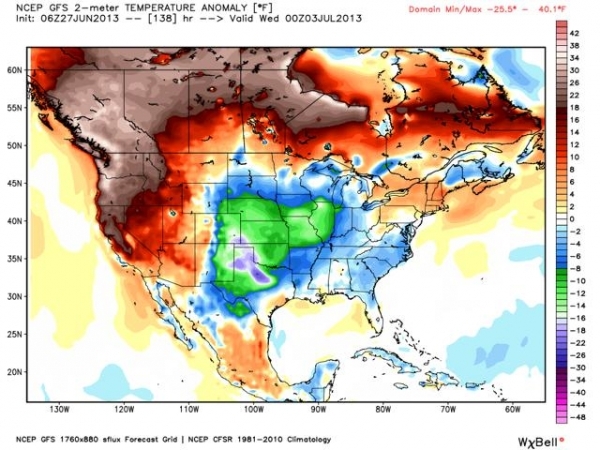 Will this heat wave affect summer melt in coming months? If so, has chances of ice-free summer in 2013 increased from 10 percent? There have been multiple heat waves around the Arctic so far this summer. A disturbing trend that appears likely to impact melt. And this particular heat pulse could deliver accelerated melt in the CAA or even the Beaufort. As for changing/increasing chances for zero ice, end season. I’m working on an assessment of how much sea ice has been softened up through June and I’ll be waiting for the PIOMAS numbers before presenting this update. I haven’t read all the comments over on my last blog entry, but from just skimming through them, it looks like you handled yourself pretty well inside the pool of doomsday sharks. I think the key point is that if we want to preserve anything of the present civilization, then we have to take extreme measures to convert to alternative energy sources and leave the fossil fuels in the ground. This will entail great sacrifice and out-of-the-box thinking, but it’s the only chance mankind has. To be honest, I think it’s too late. Only after we suffer major food shortages will people wake up. I’m in Parker, Az right now and I was told it is going to hit 124 F tomorrow. I believe that would be a new record. The Southwest will be one of those uninhabitable places by mid century. For some people, it doesn’t matter how many factual statements you post, they’ll keep shifting away from the original line of conversation in an attempt to put you on shaky ground. It’s neurotic and really starts to get on my nerves after a while. Brutus, as an example, first conflated energy with material use of fossil fuels, then jumped to the always conservative forecasts of the EIA when that didn’t work. I could have replied that we had increased alternatives as a portion of our fuel/generation base (world) from around 4% during 2000 to around 10% now (more than double in 13 years even against radical opposition by conservatives and fossil-fuel allied groups) and that EIA is conservative RE any new source additions in forecasts. But it wouldn’t matter, because he’d come up with some other nonsense in the next post to distract from these particular facts leaping on and on and on away from the original point. So I’m done with him and his divergent nonsense. I don’t have a problem with ‘doomers’ who say we’re probably finished, but we should do our best anyway. That’s practical, rational, and develops a sense of urgency, even if it is a bit pessimistic. Doomers who seem addicted to the idea of apocalypse or who endlessly whine about what we can’t do need to find some dark corner to go cry themselves to sleep in. They’re fulfilling no purpose by spewing their dark views other than to demoralize people and, in my view, are just another incarnation of denial. But in this case, it’s the denial that we have any choice other than to keep doing what we’re doing, as bad as it is. For my part, I’m all in on beating the drum for the solutions while shining a light on the emerging crisis. I hope, and I believe this is justifiable, that an energy switch will mitigate enough of the problem for us to make it through. In any case, the world will probably be radically altered even if we do. And we’ll need very resilient and just systems if we’re to have much hope of avoiding complete collapse and eventually reconstructing prosperity. So my hope is qualified. Moreso, my urgency is driven by terror of what may happen. And I really don’t even think half these doomers, who seem to lust for a horrible end, even realize what it is they’re talking about. As for the Southwest, you’re absolutely right. A severe crisis is ongoing there now. We’ll probably start to see serious community collapse as early as the 2020s with migrations following starting in the 2030s on our current path. Water will probably be the first inhibitor but heat will be terrible. Desalination may be possible in some places that have access to coastal estuaries. But a rising sea level makes that mitigation a challenging prospect. Correction… 124 F on this Saturday. Yep. Devastating heat wave in the pipe. I appreciate your efforts, perseverance, and persistence in spreading the awareness about the crisis we are facing today. However, I have slightly different take on ‘doomers’. In my opinion, there are two kinds of doomers: i) who just whine, show apathy, and aren’t willing to do anything. These doomers, as you correctly pointed out, demoralize people through their dark views. These people are not serving any purpose. Then there are other kind of doomers like myself. When I came to USA three years ago, I was full of energy, passion, and enthusiasm to build sustainable economy. I was very hopeful and optimistic on the issues of climate change. But, I started following politics of climate change. I realized that public awareness on climate change was abysmal even among the most scientifically literature people. I met many environmentalists, proponents of renewable energy, who religiously support renewable energy, but are not willing to pay for it. They say renewable energy hasn’t become cost effective yet. Its too expensive. We don’t have money yet….bla..bla.. Fossil based energy is cheap….all of these excuses. They say we should focus on energy efficiency first. We should recycle. According to them, it has huge potential to save energy. However, now we are at a point where changing light bulbs and recycling plastic are not enough at all. We need global aggressive actions. In addition, NO ONE includes the cost of extreme events and negative externalities in cost-benefit analysis. I started reading about solutions to the problems of climate change. I found that we do have all the technologies we need to mitigate ( now we cannot prevent it) climate change. However, biggest hurdle is apathy of people to understand the seriousness of the problem. People just don’t want to change their lifestyle. Behavioral change and reduction in consumption must be part of the solutions. I changed my behavior. I don’t consume a lot. I conserve as much energy as I can. I started telling my friends, family members, colleagues, random strangers about the impending crisis. I told them if we don’t do something fast enough, we are finished. We have to take drastic actions. EVERYONE of them just ignored it by thinking that politicians are doing enough about it. They said (including my parents) that I am just crazy and depressed and the problem is not that serious. They think that the actions we are taking are good enough to address the climate change. So, I am frustrated doomer. I still tell people to reduce emissions, support renewable energy whenever I get to talk to them. I don’t care if they think I am crazy. But, I have just given up the idea that we will do something with all the technological solutions we have. I TOTALLY believe that we as a society will not do anything about it as much as I believe that we CAN do something about it. In just three years, I became very pessimistic from extremely optimistic. First, you’re absolutely not crazy. I would call you conscientious, helpful, concerned, and probably a little bit scared. There is nothing wrong with any of this. Instead, I find it admirable. I think there are many people in this country who support a transition to renewable energy. Sadly, it seems they’re not in your community. So it seems you’ve been worn down both by pessimists and by people who are so consumed with their day to day lives that they’re not aware of what’s happening. You are entirely correct to say that a transition can happen and that renewables are the least expensive option, long term (especially when the externalities are taken into account). At this point, the primary inhibitor to such a rapid transition are a number of vested fossil fuel interests which endlessly sand-bag renewable energy adoption and a vast failure of leadership to decisively overcome this inertia. Despite these failures and oppositions we’ve managed to achieve a rapid ramping up of alternative energy generation, a rapid increase in vehicular fuel economy, the launch, for the first time, of viable electric and plug in electric hybrid vehicles, the popularizing of veganism, and a large and growing cultural movement to invest in renewables and divest fossil fuels. Some of these gains were achieved politically. Others were achieved by independent action. In total, we’ve managed to push US carbon emissions back to 1990s levels. And that’s major ground gained. So we have come far, but not far enough. Now, the pace of change needs to accelerate and we need to capitalize on these gains. To do this, we must ensure that unconventional fossil fuels do not gain strength. To do this, we must ensure that the nascent renewables economy continues to gain ground. And all at the same time we must convince the developing world to make a massive leap away from fossil fuels and into renewables. Even as this happens, we will face budget constraints and severe challenges in the form of increasing damage from climate change. So the temptation will be to withdraw and to not advance new energy systems. These are amazing challenges. So I do not blame people for being a little pessimistic or even for being what could be called ‘rational doomers.’ But the world cries out for responsible action and since doomers are more aware of the risks than most, they are desperately needed to advocate the new systems that have the best chance of reducing the harm that is coming. So I’m asking you, conscientious, concerned, worried doomer, though you are, to please not give up and to do your best no matter how challenging things may seem. We don’t just need aware people to sound the alarm, we also need some who tirelessly promote the means to avoid as much harm as possible. This is so shocking and must be unprecedented for June. Hate to think what would happen if this kind of heat dome emerged in August. My workplace is experiencing a bit of a baby-boom at the moment; lots of pregnant young women around the office. These same young women are TOTALLY unconcerned about climate change. One of them even told me she “loved” the March 2012 heatwave. (We’re in Canada, btw. Heatwaves in MARCH? HELLO.) Mostly they think about shopping, celebrity gossip, TV, and, presumably, their babies. But not the planet their babies will have to live on. This is possibly the worst time to be born, even in the “developed” part of the world. You’d think new parents would be on the front lines of this issue, but that’s not what I’m seeing. OK, rant over. I’m just exhausted from having to feign socially-acceptable interest and approval of human reproduction while also suppressing my freak-out. Freak-out well deserved and very well rendered. My wife and I are both vegan and we have a cat. At most, it will be one very well prepared and informed child for us. We’ll see. The world cannot support 10 billion by mid century, especially at current levels of consumption. So, it appears to me that need and greed are on a collision course that is likely to prove very harsh. Best hopes for preventing it! It is essential that a price on carbon be adopted. The idea of a carbon tax is gaining some traction. It’s been working in British Colombia. This week 350 members of Citizens Climate Lobby were in congressional and senate offices lobbying for a fee and dividend approach (revenue-neutral carbon tax) that would see a $15 per ton fee rise by $10 per year over ten years (and likely continue to rise indefinitely). This would start to shift the economy so that renewables looked a lot more cost-effective, and fossil fuels would really start to look like yesterday’s energy, which is what they are. More people are needed to join in this lobbying of elected representatives, and writing letters to the editor, to help get the conversation really going on this so it can be implemented soon. http://www.citizensclimatelobby.org in the US, http://www.citizensclimatelobby.ca in Canada. I couldn’t agree more, Lyn. BC’s done an excellent job and seems to be one of the most successful in moving toward active sustainability. I love the passion that I read from contributors in this blog. Wish we were all living in the same village so we could go about becoming as self contained as possible, grog, energy, water, food, grog; while making heaps of bio-char. Never mind. Because all of us influence others with our thoughts, staying positive is the way to go. I plan to make a difference in my village / suburb, and already have I think. Regarding others: Most of them have never given anything outside their own homes and work, much thought. They watch junk TV, listen to junk talk back radio, and the worst eat lots of crap junk food. It is a while since we had a big war so there many more examples of chaff / grunts living today. i choose not to loose sleep over these gen-y; who have had it too easy for too long and doing their best to piss their parents efforts against the wall. Most of them would rather die than change and usually do. From you all, I know that there are heaps of thinking people out there and these are the ones that I give time to! What I said back here has come to pass, The Jet stream has not only got drawn to the North Pole, it is circling it. and only reason why it clear up and got warmer, is because the Air Lines didn’t fly for 3 days to load up the Jet Stream with More and more Carbon Soot. Congress better get their head out of the Sand. This will only get worse and worse and kill more people and damage more property, until the people start to Sue the Air Lines, Oil Companies, the EPA, who has been sued so many times, nothing happens. Very pleased to find this web sight and to read the communications of sane people that hold Steve Goddard and Anthony Watts in the same category as myself, they are lying disinfo nut jobs. In addition, there are the 26 global ionosphere heater facilities known by many as HAARP installations. I most sincerely hope that the geoengineering elephant in the room will be put into this important climate discussion.